We’ve tried out oodles of portable Bluetooth speakers over the years and we update this article every few months as new options come out. I’ve been travelling the world for a decade and a half, and no matter how much I whittle down my luggage to the bare essentials, I always have room for a small speaker. I love to follow my podcasts, I to share and discover music with people from all over the world, and to improvise occasional mini-dance party in my Airbnb. My phone’s speaker just doesn’t cut it. It’s pretty vital to travel with good sound. We’ve tried out dozens of different Bluetooth speakers for this site, and we also continue to read all speaker reviews from top consumer test organizations, tech sites, and bloggers around the world. It’s not easy to pick just one travel Bluetooth speaker from the heap, but if we had to do it, here’s the current winner we’d take on any trip. The Ultimate Ears Boom 3 is our favorite road speaker. Want a Better Bass for Your Travels, and Willing to Carry a Heftier Speaker? Our first Bluetooth speaker article was published in 2015. It has since been updated every few months with additions, changed recommendations, and new products, and also had a few major overhauls. On April 14, 2017, we started logging these changes here; we added the UE Wonderboom to the recommended cheaper speakers. On May 3, 2017 we made a few changes and added the Etekcity RoverBeats T3. On May 8, 2017 we added the CRDC Life. On May June 2, 2017 we added a discussion of the JBL Flip 4 and made a few other updates. On June 21, 2017 we updated the discussion of the CRDC Life. On August 11, 2017, we updated the information on the Fugoo and Bose Soundlink Revolve speakers. On August 15-16, 2017, we removed speakers that were no longer available, updated the descriptions of our main pick, added some great alternate recommendations that have been recently released. We also rewrote the dumb parts. On Nov. 2, 2017, we added the AOSM speaker. On Nov. 3, we added the Bose Soundlink Micro. On Nov. 7, 2017, we added the supercheap tiniest speaker. 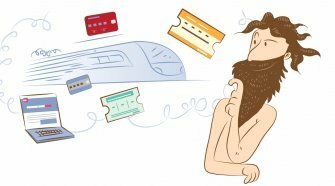 On July 18-20, 2017, we did a major overhaul of the whole article with some updated recommendations concerning new speakers and eliminating those that are no longer available. On July 22. 2018: removed the no-longer-available the AOSM Portable TWS Bluetooth speaker, CRDC Life and Etekcity RoverBeats T3. Complete overhaul with updated recommendations on October 23, 2018. April 8, 2018: Updated with more opinions on the sound of the Boom 3 and better photos. We’ll discuss its main road-worthy features first, then its sound — including a meta-take on critics views of this versus other portable speakers. We tested the waterproofing of the Ultimate Ears Boom 3 in a bathtub. No problems found. Let’s be honest; there’s really no reason to have it in the tub with you, but it is nice to know that it’s plenty well built to take any road abuse. This is not a feature-rich speaker, but it does include everything we find essential for use anywhere. No you’re not actually going to listen to your speaker underwater. But with the Ultimate Ears Boom 3, you could. The IP67 waterproof rating means that the unit is rated to be immersed under a meter of water for up to 30 minutes with no damage. This is a specific and meaningful claim (with legal implications) under the conditions of the International Electrotechnical Commission’s standards. In our test it sounds fine in the bathtub, but really, just put it next to your bath, shower, or pool. We do like knowing that we can easily wash it when needed, and that the odd splash of water won’t hurt it, but the 7 rating in waterproofing (meaning it can be submerged) is a bit overkill. The 6 in the rating also means that it is “dustproof” and meets the standards for keeping dust out of the unit — an extra level of protection that is rare in such speakers, even those that are rated as waterproof. The “drop-proofing” is a vaguer claim from Ultimate Ears that meets no specific standards, but the company claims that the Boom 3 passed various drop and durability tests. We were not so interested in testing this particular claim, but clumsier Amazon reviewers report that they’ve dropped it with no problems or even scratches. (The same was reported with its predecessor UE Boom 2.) And prior to picking up a Boom 3, I myself was using, dropping, and bumping an (ancient-model, long discontinued) UE Mini speaker from the same manufacturer for many, many years and to this day it plays perfectly. The battery still works great too. This is not the longest battery life for a quality small travel speaker (the Fugoo Tough described below goes for 40 hours) but the Boom 3 has more battery time than most reasonable people will ever need. (We also recommend carrying a backup battery for our devices when on the road, which could be used to charge your speaker in a pinch.) The Boom 3 lasts for 15 hours of constant use. In the real world, I used it without charging for a two-week trip that included several spurts of use in (3-4-hour) car trips, and use in hotel rooms, showers, little improvised dance parties, and more with more battery to spare at the end. The Ultimate Ears Boom 3’s USB-A to USB-B cable plugs into any standard USB charger, such as one of the ports on the travel adapter and USB charger that we recommend, shown here. The Boom 3’s provided USB cable is long enough to be useful for reaching to plug it in behind furniture or in odd places in a hotel for charging. It’s sturdy enough to hold up over time on the road. 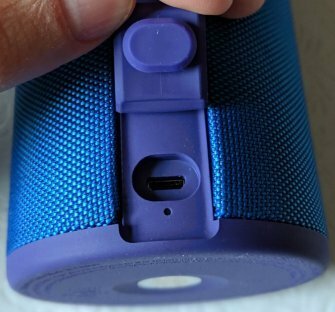 It’s also convenient that this speaker charges via a standard mini USB-B port, so it’s easy to borrow a charger from someone’s phone if you haven’t brought the Boom 3’s (included) cable and plug with you. The Ultimate Ears Boom 3 can be charged with any standard micro USB-B cable, like what most cell phones charged with up until a few years ago, and what plenty of smaller devices still use to charge. The other power option is an optional charging dock, which we think is a very lovely way to display and listen to your Boom 3 at home. You simply plop the speaker down on this stand and it starts charging. Super convenient, though it’s also a bit overpriced. The Ultimate Ears Boom 3 in my masculine though hardly enormous hand (to give an idea of size). It’s a 2.9 inch diameter speaker that’s 7.2 inches tall. I carry it in a drinks sleeve in my pack, and the drinks slot when I’m using it in a car. 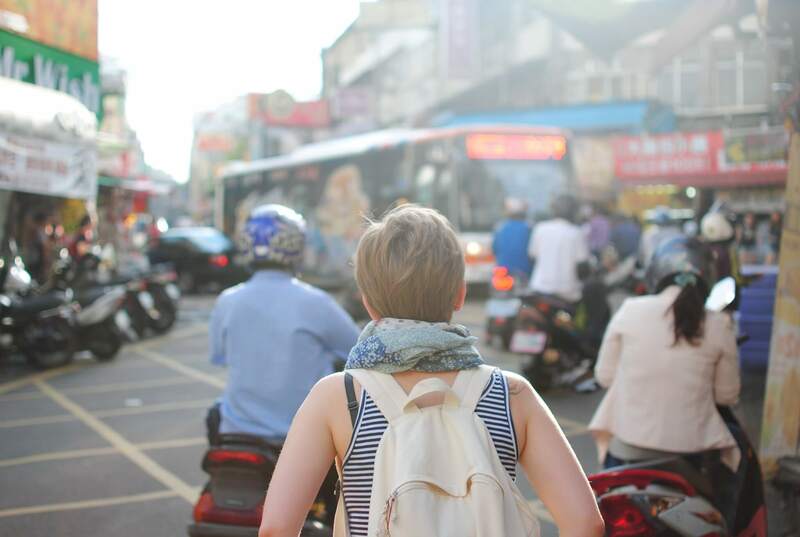 If you’ve seen our commentary on toiletry kits, you know that we’re obsessed with the utility of being able to hang things while travelling, and staying in cramped quarters. You can use a carabiner to attach your Ultimate Ears Boom 3’s hang loop to a backpack, a fence, a chair, a towel hook when you’re the shower… this is a very small but incredibly convenient feature. At least I think so; I always seem to run out of space to set stuff out on when I’m staying in weird corners of the world. You can use the Ultimate Ears Boom 3 without installing any special apps as a simple Bluetooth-connected speaker. But you’ll want the relevant Android or iOS app for your phone as they add quite a bit of functionality. The “block party” features allows three people to share/fight for DJ-rights to the speaker. You can remotely turn the speaker on and off, which turns out to be quite convenient for making sure you save battery when the speaker is a bit further than you’d like to reach, or for turning it on to find it by sound if misplaced. Customize the EQ to your taste. Use the speaker as a musical alarm. Connect multiple Boom 3 speakers for bigger sound. 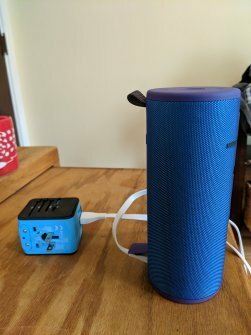 You can also connect 150+ Ultimate Ears Boom, Boom 2, Megaboom, and Megaboom 3 and have them all blasting music from your little old phone. 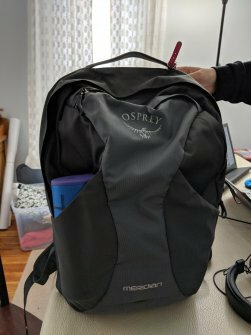 The Boom 3 can be carried in the water bottle pocket of your pack or daypack, and is shown here in the daypack of the Osprey Meridian 60. The Boom 3 is a very packable 2.9-in. (7.3 cm.) diameter cylinder and is 7.2 in. (18.4 cm.) tall. It weighs 1.34 lbs. (608 g.). 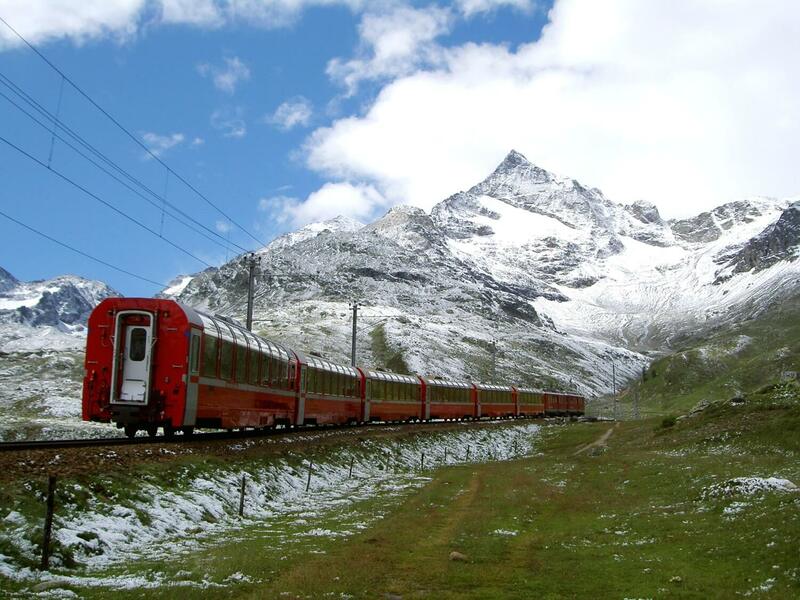 Want to travel even lighter? We totally understand. In that case opt instead for the Bose Soundlink Micro described below. If you want a speaker you can chat with (ask about the weather, news, control a smart home), you can see our comparison with the Ultimate Ears Blast. But note that we wouldn’t really bother recommending any smart speaker, at least in terms of travel, as all smart speakers currently only work when connected to WiFi. We also think that smart speakers are a bit gimmicky and not all that useful; if you want an assistant we’d go instead for a (much more useful, nearly essential) screen on a unit like the Echo Spot, Show or Google Home Hub for your home, and get a separate durable speaker for the road. Our top-pick travel speaker Ultimate Ears Boom 3 is, as you may suspect, the third in a series. The previous UE Boom and UE Boom 2 were both revolutionary hits with reviewers when released with tech press, audiophiles, and international consumer and testing organizations. These were the first speakers to really do 360-degree audio and they packed an incredible punch for their small size. The competition has caught up, definitely, and plenty of other portable Bluetooth speakers sound wonderful. But the Boom 3 has improved over the Boom 2 too. Thus far the critics have been heaping praise on the new portable party guy from Ultimate Ears, saying that its sound has a bit better performance at top volumes. Since speaker tastes are subjective, our meta-take is always to look for an overall consensus in this way rather than taking just our ears or any other one critic’s tastes as gospel. And overall the experts think that the Boom 3 sounds fantastic. Its 2-inch drivers and 2×4-inch passive radiators punch out powerful sound and relatively deep bass for such a small unit with little risk of distortion. It’s an impressive feat of engineering and it doesn’t — like certain competitors, hike up the bass end to try to cover sloppy performance. The sound is balanced and rich, clear and sweet in the mids, and often described as “punchy” or “dynamic”. The Ultimate Ears Boom 3 pictured in action, filling a 400-square-foot living room and dining room area with plenty of sound. It was still a bit too much at top volume, in fact, and we had to turn it down. Of the many Bluetooth speakers that I’ve personally listened to, the Ultimate Ears Boom 3 is the best sounding of its size, and certainly has the most convincing bass — not quite as deep and pleasing as high-end home bookshelf speakers, but it’s getting well close, which to my mind is fantastic for someone who is rarely in my living room enough to enjoy those. The speaker goes quite loud (up to 90 dBA) and doesn’t have issues with distortion or odd mix effects when it gets up to its limits. Pushed to the max it was uncomfortably loud in a large interior living room/dining area, and could certainly serve as the sound system for a house party if needed. 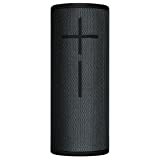 Also crucial for good sound in practical outdoor settings or larger rooms is the UE Boom 3’s 360-degree output. No matter which side of the speaker you’re on, it sounds the same. The speaker is designed to be placed in the center of the action, and be equally enjoyable from any side. This means you can take a party to go and place the speaker in the center of the action, and it will sound great to everyone. There is always a trade-off between a speaker’s size and its ability to deliver convincing bass and volume, so of course some larger Bluetooth speakers do sound better especially on the bass end. In this article we focus on portable units and compare the Boom 3’s sound to them; we separately cover the bigger, less portable Bluetooth speakers here. The Boom 3 is to most ears the best-sounding speaker with the features and the size that a traveller wants, but you might also compare it to the Megaboom 3 if you’re willing to carry about twice the weight. It’s a bit expensive. You can certainly spend less and still have a great-sounding and robustly durable travel speaker (see below). In addition to the Amazon box at right, you can check Best Buy and Ebay, although we haven’t thus far seen better prices there. Some retailers (especially Amazon) do sometimes have different prices depending on the color you buy, so you may want to click around to different colors if you’re flexible and see what each costs. We wouldn’t recommend buying a used Boom 3 —or any other battery-containing electronic device — as there is no telling how many cycles the battery has already been through at the time of purchase. You may end up having to replace the battery too soon (though our experience with Ultimate Ears batteries has generally been quite good). The Boom 3 is an incredibly rugged speaker and we don’t think it really needs a case (we do travel with our cables neatly stored and protected in a Skooba Cable Stable however). But we hear that lots of our readers do buy cases anyway. While we have no idea what’s best, here’s the top three with our obviously savvy and stylish readership. The cases do also provide a nice way to organize and protect the charging cable and keep it alongside the speaker. 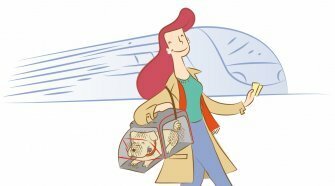 Depending on your audio preferences and travel style, the following speakers may be more suitable for your voyages. 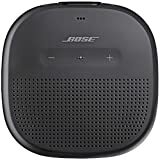 The Bose Soundlink Mini II is a good choice for the audiophile who wants a tiny Bluetooth speaker for mainly inside use on the road (hotel rooms, etc. ), and doesn’t need the waterproofing or klutz-proofing of our main pick. You can’t pair two of them together for stereo, unlike our main pick. 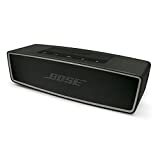 The Bose Soundlink Mini II measures 7.1 x 2.3 x 2 inches (18 x 5.8 x 5.1 cm). The major drawback is that it’s a heavy little guy (1.5 pounds/.68 kg) and not as rugged and suitable for rough travel as our main pick. Its battery life has been tested at 8-10 hours. The Fugoo Tough is designed to withstand snow, mud, shocks, and submersion underwater. It has an IP67 rating just like our main pick and a removable jacket that suggests it’s going into war — It’s not going to have any issues with being dropped, bumped, or kicked around. It’s also the speaker we’d recommend with the most battery life: 40 hours. Overall it doesn’t get near as many accolades for sound as our main pick, but it’s not too bad either. Several reviewers quite like how it handles music, while another faults it for lack of bass and volume. Fugoo sells basically the same speaker in Sport, Style S, and Fugoo Style versions, but the Tough version is the only one that might make sense for some travellers as it is the most indestructible of the lot, and that’s what Fugoo has going for it in comparison to other options. We have done a full analysis of the differences between these Fugoo speakers. And we have a more complete comparison of the Fugoo, UE, and Bose lines of speakers. We’re all about travelling light so we’ve focused this article on speakers that are about the size and weight of the UE Boom 3. If you think you can carry more, you’ll also be able to get more volume and better sound — this is a basic law of speaker tech. Our rugged, larger travel speaker recommendation is the Ultimate Ears Megaboom 3. In our direct comparison of the Boom 3 and Megaboom 3 we note that they’re almost identical in terms of design but the Megaboom 3 offers a bit more soundstage and performs better on the bass end. It goes deeper, and its lows on bass-heavy tracks are more full and convincing. At about half the size and weight of our main pick, the Bose has introduced a clippable, pocketable marvel that still somehow manages to deliver signature Bose evenness and clarity, and even enough loudness to fill a room or work for outdoor listening. The Bose Soundlink Micro measures 3.87 inches (9.8 cm) square and is 1.37 inches (3.5 cm) thick; it weighs 0.64 pounds (.29 kg), making it one of the lightest speakers we’ve ever recommended. It’s fully IPX7 waterproof and has a very durable rubberized chassis. The tech critics and audiophiles who have reviewed it tend to agree that its clarity is great and there is even somewhat of a soundstage and a solid bass end; it’s widely held to be the best-sounding small speaker of its size. The main complaint it gets is its price; this costs more than most such tiny speakers. And the battery life of six hours may deter some (though if you’re carrying your own spare USB battery in your pack you don’t have to worry). Overall, if you’re someone who is into extremely light packing and you need your tunes on the go, this is the speaker to go for. See also our comparison of the Micro with the Bose Soundlink Color II. Our top pick is louder and sounds a bit better than the options in this section; we think it’s worth it as we travel constantly. But there are other, cheaper options that are similarly lovely if you don’t need that extra oomph, or want to spend a bit less. You might also especially consider the first option and buying two of them for a portable stereo pair. This comes from the same designers as our top pick and shares a similar vision, if in a quite different form: the UE Roll 2. It is a 5.3-inch disk that is designed to be placed in the center of the action and also deliver 360-degree sound. It is IPX7 waterproof and comes with pool float, for those who like to lounge out in the water with their tunes floating next to them. The UE Roll 2 is cheaper than our main pick, and it’s not as powerful, but it still delivers quite impressive loudness and bass. Reviewers have generally loved its sound; they say that “little details…sizzle”, that it is “clear” and “natural”, and that the low end is “solid”. It has an integrated bungee cable on the back that allows you to hang or attach the speaker anywhere (such as the back of your backpack). As with the other UE options, if you buy two you can set them up as completely wireless stereo speakers via dedicated iOS or Android apps. In various reviewers’ tests, its battery life comes to 9 to 11.5 hours. Reviewers noted little difference in sound quality between this speaker and the previous version, and the UK consumer organization actually preferred the original UE Roll to its successor. Given all this, you might see if you can snag the original UE Roll, which has sometimes been cheaper on Amazon (click through to check current prices). The main improvements to the new version are a couple of hours of battery life and that it can kick out a few more decibels. For most listeners, the older version is just as great. The UE Wonderboom is similar in price and features to the UE Roll 2, but is built to deliver 360-degree sound and go just a bit louder. It’s also dustproof, and according to reviewers’ tests, it survives drops well. It’s a bit shorter and squatter than than our main pick UE Boom 3. Your can check our full summary of UE Wonderboom reviews, but the main takeaway is that this would be a great, cheap choice for camping. 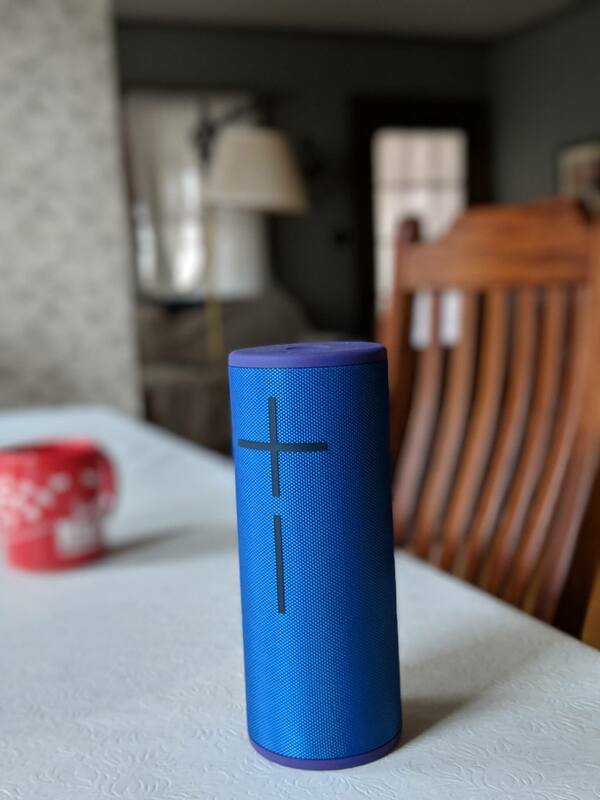 The Cambridge Soundworks Oontz Curve is a favorite of the few audio reviewers who deign to try out under-$50 portable bluetooth speakers, saying for example that “the sound is amazingly full for such a small speaker” and “there was no audible distortion”. It doesn’t play as loud or deliver as much bass as larger and more expensive speakers, but it’s the best option at this price range and relatively well-liked by its Amazon reviewers as well. It measures 2.6 inches (6.6 cm) tall and has a diameter of 2.9 inches (7.4 cm); it weighs .56 pounds (.254 kg). 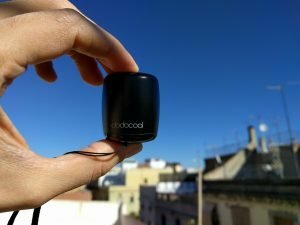 Dodocool’s speaker, the smallest Bluetooth speaker we’ve tried, sounds better than any cell phone’s internal speaker. This tiny little speaker is dirt cheap, easily fits in any pocket or even on a keychain, and will sound better (slightly) and louder than your mobile phone. The Dodocool Bluetooth Speaker‘s connectivity is not great — the Bluetooth signal is prone to drop, especially if you’re trying to listen while the speaker is charging (not recommended). And the Dodocool certainly didn’t sound as good as any of the other, larger speakers we recommend. But it’s loud enough to be heard in the shower and provides more clarity and oomph than your mobile phone’s built-in speaker. Don’t expect bass, of course. I know one extremely light traveller who tours the globe with only what fits in his shoulder bag; this is the kind of travel bluetooth speaker that he could easily carry. The Bose Soundlink Color II is the small-to-mid-sized Bluetooth speaker to get if you want a decent soundstage and the smooth mids and trebles that the Bose universe tends to provide. The Color II not as loud, and doesn’t kick out as much powerful bass as some of the other options, but the critics and consumer organizations report that holds it own and is excellent for filling a room with clean, detailed sound. We offer a full comparison of the Soundlink Color II with the other Bose speakers. The Color II is directional, meaning that it sounds best when you’re right in front of it, and it’s spash-resistant (but not waterproof) and has a rubberized body so is expected to survive drops well. Overall, that makes it a nice-enough speaker to travel with, but the UE Boom 3 seems like a better deal to us. The Bose Soundlink Color II measures 2.2 x 5.0 x 5.2 inches (5.6 x 12.7 x 13.2 cm) and weighs 1.2 pounds (.544 kg). We think that the JBL Flip 4 doesn’t measure up to the Ultimate Ears or Bose options, but it is a very good speaker. Critics across the board liked its crispness and convincing bass, but also complained that it distorts a bit at the highest volumes and over-emphasizes the treble. It’s fully waterproof (IPX7) and has a 12-hour battery life, but at this price point, you’re better off with the budget picks above. These speakers don’t deliver the best sound quality according to reviewers, nor even the best audio for their price range. But if you want a very cheap speaker that sounds decent and is waterproof and can be strapped to anything, the Boom Swimmer is your guy. You can also remove the funky tail and use the suction cup to stick it to a wet wall or a glass window, which can help deliver more resonant bass. The battery life is excellent for the price range; eight hours at full volume, and up to 16 at half. The Polk Audio Boom Swimmer Duo allows you to link two of them for stereo; the Polk Audio Boom Swimmer Junior is smaller but delivers nearly as much sound. The AYL Portable Mini Capsule Speaker System is not actually a bluetooth speaker, but connects via a mini cable. It’s really small and really cheap, and considering that sounds decent according to some. If you have a modern smartphone or tablet, though, your sound may already be better directly from that. The B&O Play, a.k.a. Bang & Olufson Beoplay A2 is an expensive audiophile brand’s entry into the portable bluetooth speaker market; reviewers liked its sound OK, but also expressed quite a bit of disappointment in this famous brand’s shortcomings with this entry. The upper bass end doesn’t have much punch, there is a lack of warmth and clarity falls short depending on where you are positioned (it is nominally omnidirectional). Like our main pick at the top, it can be paired with another for stereo sound, but you’d be wasting a lot of money for not much effect. 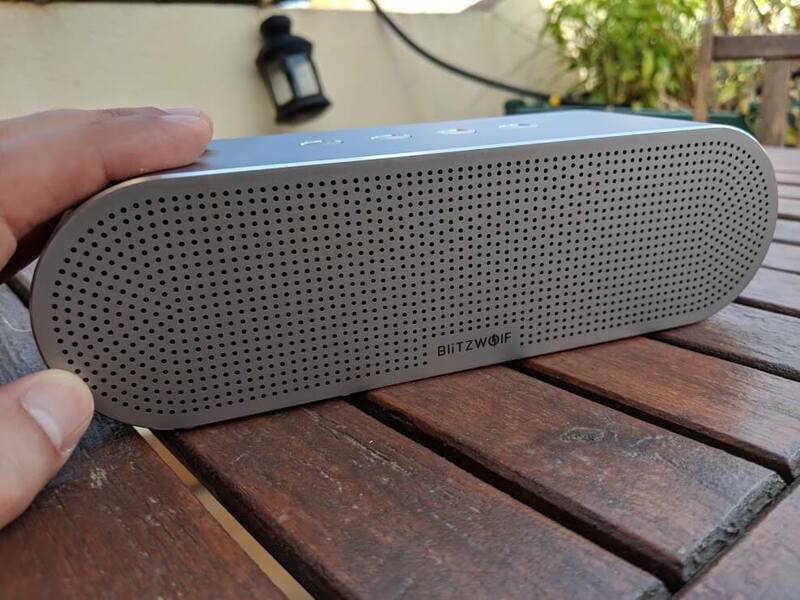 The Bliiq Infinite X Portable Bluetooth Speaker could be OK for someone who appreciates a micro-SD card slot, but most will prefer to just play music from their phones or tablets. It has decent water-resistance (IPX4) but is not fully waterproof. We have yet to come into quality reviews of these speaker’s sound, but there are a number of customer complaints at Amazon about its low volume. We’d recommend instead any of the budget options (above). Reviewing the Blitzwolf BW-AS1. Good volume, good looks, not much bass. We’ve listened to the Blitzwolf BW-AS1 recently and enjoyed the detail in the mids, but they were overemphasized and we missed a lot of bass that can be present on other speakers of this size and weight. It’s a stereo speaker with dual 45mm 10W speakers, and the battery lasts for 7-11 hours. It’s about the same size as our main pick but surprisingly heavy — we think too much so for taking on trips: 1.7 lbs (.75 kg). We recently completed a comparative meta-review of the differences between the Bose Soundlink Revolve and Bose Soundlink Revolve+, which we think are both quite fine Bluetooth speakers but perhaps not what we’d want to take on the road. In our comparison with the UE Boom 2, we note that critics think the Revolves sounded warm and detailed in the mids and high end, but that the bass was more convincing on the Ultimate Ears speaker. There were also some complaints that they struggled more at high volumes. The Revolves are more expensive, at $199 for the Revolve and $299 for the Revolve+. The Braven BRV-1 is very rugged and sounds pretty good, but not as good as other options out there, according to CNET and Digital Trends. The Cambridge Audio Minx Go v2 delivers good sound, but was not as universally admired as our main picks. The Cambridge Audio G2 is a Bose Soundlink Mini II competitor that had mixed responses from critics, calling it “muffled” and “too heavy in the mid-lows”. The Jawbone Mini Jambox sounds great but doesn’t play very loud. The Jawbone Big Jambox is admired by some critics, but they generally prefer the main picks above. The Monster Superstar‘s bass is quite limited. As of this writing there are a couple of reviews out there of the Oontz Angle 3, but no serious comparisons to other speakers by anyone who is an expert in audio. This speaker is quite popular on Amazon, and most reviewers there seem to be enjoying their purchase as a functional and loud-enough option for “rocking out in the shower” or listening to audio books. We can’t recommend this over the other cheap options (above) until we see more written about it or try it out ourselves, but it may be another good option at the lowest price point. The Photive HYDRA is durable, rather waterproof, and is reported to deliver enough sound for the shower, for example, but doesn’t have much bass and don’t expect great volume. The Polk Audio BITR-A Boom Bit is one of the smallest Bluetooth speakers and is designed to be clipped to your shirt collar — it’s more of a personal, open headphone alternative than something you would use to fill a room with sound, much less party outside. Reviewers say that it packs impressive punch and reasonable sound, but only for its size. One says it sounds like a transistor radio. Really this is mainly for runners and bikers who want an alternative to headphones, which can be dangerous in that they block out other noise. Demanding tech critics really loved the clean, even, authentic sound produced by the Riva S — but it’s now often out of stock and possibly being discontinued. Also, it doesn’t have the 360-degree delivery and it doesn’t go quite as loud as our main pick. The other downsides are that it is only IPX4 (i.e., water-resistant, can survive the odd splash) instead of waterproof, and so not as rugged for travel. We’d prefer to have a speaker that can go into the real, messy outdoors, and not worry about dirt, water, and being able to hear it well in a noisy place. The Riva S has a 13-hour battery life and you can charge your phone or tablet off of the Riva’s battery — a feature that’s rather likely to come in handy at some point. If you buy two of them, you can pair them together for stereo sound. It comes with a carrying case and international plugs, which is a classy touch for travellers — though you can also just get a universal adapter. The unit measures 7.5 x 2.6 x 2.5 inches (19 x 6.6 x 6.4 cm) and weighs 1.5 pounds (.68 kg). It may also still be available on Ebay. The Samsung Level Box Mini has gotten a mix of customer reviews but most are positive, if undemanding in terms of audio expectations. Likewise for blogger reviews. The price has dropped some 70 percent on Amazon as of this writing, but we think our cheap options above are a surer bet. The Skullcandy Barricade Bluetooth Speaker floats and is fully waterproof. Its few reviewers liked its even, faithful mix, but said that it distorted on the low end at high volumes. It also comes in Skullcandy Shrapnel Drop-Proof Barricade, Skullcandy Barricade Mini, and Skullcandy XL versions. 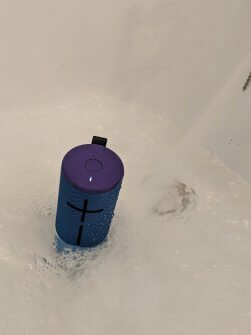 If you’re looking for a great sounding waterproof speaker at under a hundred bucks, the UE Roll 2 (above) is a safer bet. The SOL Republic Deck was pretty well-liked by some reviewers, though they weren’t in completely in love with it or anything. It is long and thin, and its price has dropped significantly, so it could now be considered a decent cheap option, but still not as good as our other cheap picks above. The Sony SRS-X11 is a tiny cube that was the most well-liked extremely small speaker over at Which?, but other reviewers say that it is overpriced and that its sound is only decent. Most think that the Oontz Z Curve described above is better. The Sony H.ear Go (SRSHG1) is a uniquely small (8.25 x 3.75 x 2.5 in. or 21 x 9.5 x 6.4 cm) solution offering Wi-Fi as well as Bluetooth, thus supposedly enabling a higher fidelity connection for those listening to uncompressed audio files on the go. This doesn’t actually apply to many people; you’re likely using compressed files (MP3s or a streaming service) on your phone on the go anyway. Some reviewers really liked how it sounded and some didn’t. Our top pick above is a surer bet for your aural enjoyment at this price range. The Soundboks‘ claim to fame is that it’s the loudest bluetooth speaker on the market. Reviewers say that this is true, but that the sound is terrible. 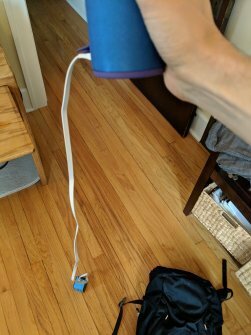 It is also huge; if you want to annoy your neighbors there are cheaper and better ways to do so — like running an extension cord to a powered setup in your yard. Several SoundBot Bluetooth speakers get decent if unexceptional ratings over at Amazon; we have not tried them out ourselves nor encountered serious reviews or testing of any of these at this point, however. With Ultimate Ears speakers especially, it’s very worth clicking over to Amazon and checking out prices for various colors, as they vary widely at times. It’s really so helpful article, you should write daily basic. Great reviews. Can you recommend something that’s small and flat like the jbl go 2 or altec lansing h20 3, that can pair with another, that sounds decent? Neither of these get loud enough. I have a pair of oontz angles, but they’re too big for a pocket and won’t pair to each other. Thanks, you’re all so sweet. In your shoes I think I’d go for two UE Roll 2s, as mentioned above. They’re flat-ish, but not quite pocket-sized. You really do have to trade off larger size for larger sound, I’m afraid. Thanks for your good job. 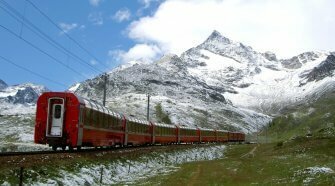 It’s really so helpful article for all travelers, to be continue your good job. This is one of the best reviews I’ve read about any item. It’s given added credibility because you draw on third party opinions. I’m seeking lightweight, stereo and good battery life. I think leaving out any Marshall product is a terrible oversight in this otherwise very useful roundup! I own the 1st gen Kilburn, and it still pumps out more bass than almost anything listed here, boasts a carry handle, solid highs and mids with very pleasing, warm sound, and excellent battery life. It falls right in line with the price of several entries in this list, and has great build quality. The only negative is the weight, but if you’re traveling by vehicle to your campsite (or other destination) the weight is less of an issue, and you are rewarded with shockingly good sound for the size of the speaker. They make a smaller portable BT speaker, in addition to the Kilburn. You say that some critics say the Charge 2+ sounds better than the 3, and you give a link. 3 links indeed. Well, in none of them there is such a statement. The Charge 3 isn’t mentioned at all. You’ll want to look at the links reviewing the Charge 3 in the paragraph above that; several reviewers made that comment though it was a mixed sentiment. Thanks for your careful reading, hope you find the right speaker for you! How can it be voice controlled with google home? Edit (Oct 23, 2018): Nope. Voice-controlled speakers need to be connected to wifi to work and we’re discussing travel speakers here. We’d recommend checking out our smart speaker reviews. Hi Akshat, we have a separate review of the smallest speakers. Enjoy! I was wondering. Would two UE Roll 2’s in stereo be better than one UE Boom 2? In a word, yes. The two UE Roll 2s can provide stereo separation or simply more sound. On the other hand, it’s more to carry around than if you get a single UE Boom 2. The best speaker is the one that you have with you; you may be more likely to carry a single UE Boom 2 more often than if you have two UE Roll 2s. What about JBL Flip 3? No mention of that? I realisre the article must have been written before Flip3 was released. So if you could give an opinion now? Frankly, an oversight from our last update. We’ve now updated our coverage from the JBL Flip 2 to JBL Flip 3. As we describe in our update (above), it’s pretty well liked by critics and not a bad option, but most people will frankly prefer our other budget picks. It’s a decent speaker though. Thanks for commenting. I purchased the phk brick sounds really good its punchy and clear ! Awesome article. I love your thorough, meta style. Q: any word on the UE Megaboom? Given the fine coverage you give of the Boom 2, surely the Megaboom deserves some discussion, and a comparison of its sound with the Boom 2. Thx! 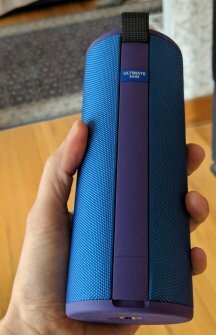 Perhaps a bit late for you, but we now have a comparison of the UE Boom 2 and UE Megaboom. The Megaboom was considered too large for this article.
? How can you not have JBL Extream and Fugoo XL in this list? We certainly considered them; both the JBL Xtreme and the Fugoo XL are quality speakers, but far too bulky (I’ve added them just now to that list). Our recommendations are very much focused on portable options. It sounds like the Bowers & Wilkens T7 would be the best option for you, however. This article is fantastic — thank you! I’m looking for something self-powered that gets produces good sound and gets loud — that’s my main requirement. Cost, portability etc are less important. Do you have any recommendations? The only really loud option I could find is the Soundboks, but review sites indicate that the sound quality isn’t very good. What’s the next loudest option out there that has good sound quality? This site focuses on portable equipment at this time; it sounds like you want battery-powered loudspeakers like these — you might start your search there.